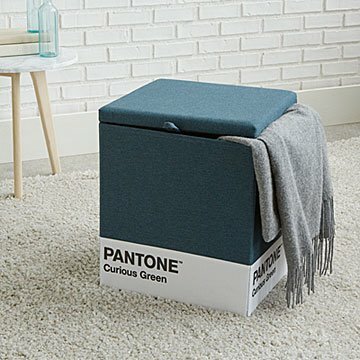 Add a pop of color (and some extra storage) to your space with this Pantone™ stool. There are 1,867 colors in the Pantone Matching System®, making it the go-to color guide for many artists and designers. This stool precisely matches an iconic Pantone™ chip, making it a go-to gift idea for any color connoisseur. While we don't quite have all 1,867 hues covered, it is available in five fun shades. It comes flat-packed and doesn't require any tools for assembly, but once you pop it together, the sturdy stool holds up to 200 pounds. Since there's room for storage inside, it's also a space-saver. Use it as an ottoman to complement your decor, for multi-purpose seating in a dorm room, or to stash your ever-accumulating art supplies. (That last one's a tip from our own graphic designer.) Made in New York.